Trinity Rep Ushers In New Year With "Crime & Punishment"
To Star In "Crime & Punishment"
Trinity Repertory Theatre ushers in 2013 with a bold retelling of Dostoyevsky’s classic psychological novel "Crime and Punishment." Directed by Brian Mertes and running January 17 through February 24, the production moves seamlessly between past and present as the play’s tense story line -- will a man get away with murder? And should he? -- builds to an explosive climax. Co-adaptors Marilyn Campbell and Curt Columbus have spun Dostoyevsky’s complex story into a 90-minute, three-actor tour-de-force with a modern, poetic flair. The three-person cast features TV film and stage actor Dan Butler (at left) in his first return to the Trinity Rep stage after a 28-year hiatus. A member of Trinity Rep's resident acting from 1978 - 1984, Butler is instantly recognizable from numerous film and television appearances, including his six season role as the hyperkinetic sportscaster, Bulldog, on "Frasier." Butler plays astute detective Porfiry who is doggedly determined to solve a grisly murder. 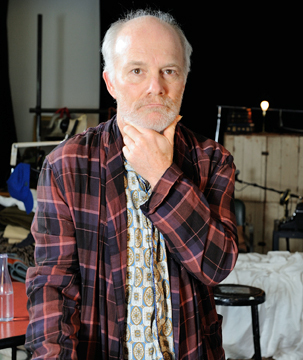 Current Trinity Rep resident company member Stephen Thorne plays Raskolnikov, the former student who commits a heinous crime and is then wracked with guilt over his actions. Rachel Christopher rounds out the trio as the prostitute Sonia, the self-sacrificing young woman who becomes a source of strength and rehabilitation to the tortured Raskolnikov. Co-adaptor Columbus explained why the story is approachable and relevant for today's audiences. "Dostoyevsky's main interest was writing about the life of the common man -- not someone who is rich or famous -- but an average human being struggling to stay alive, to stay sane, to stay whole. Our main character, Raskolnikov, is that everyman. He wants to succeed. He wants to be significant, he wants to be remembered. Unfortunately, his world is filled with anonymity and limited options. Here we are, 150 years later, and we see so many people struggling still in the wake of the global financial crash, filled with doubt, filled with rage, longing to regain a place in life." Talkbacks will be held after every performance of "Crime and Punishment." Audience members are invited to share their response to the play’s production and themes for approximately twenty minutes. Continuing Trinity Rep's tradition of offering affordable tickets for all, "Crime and Punishment" will offer discounted previews from January 17 - 19. Friday, January 18, is Pay What You Can (PWYC) night. Tickets will go on sale that evening at 6:30 p.m. with a limit of one ticket per person. New for 2013 is the Lunchtime Matinee Deal: all seats are $15 for noon matinees on Wednesday, January 23, and Wednesday, February 6.